Give me a description of what you want to accomplish, if you can send some sketches or pictures of something that you want to end up with that will help. 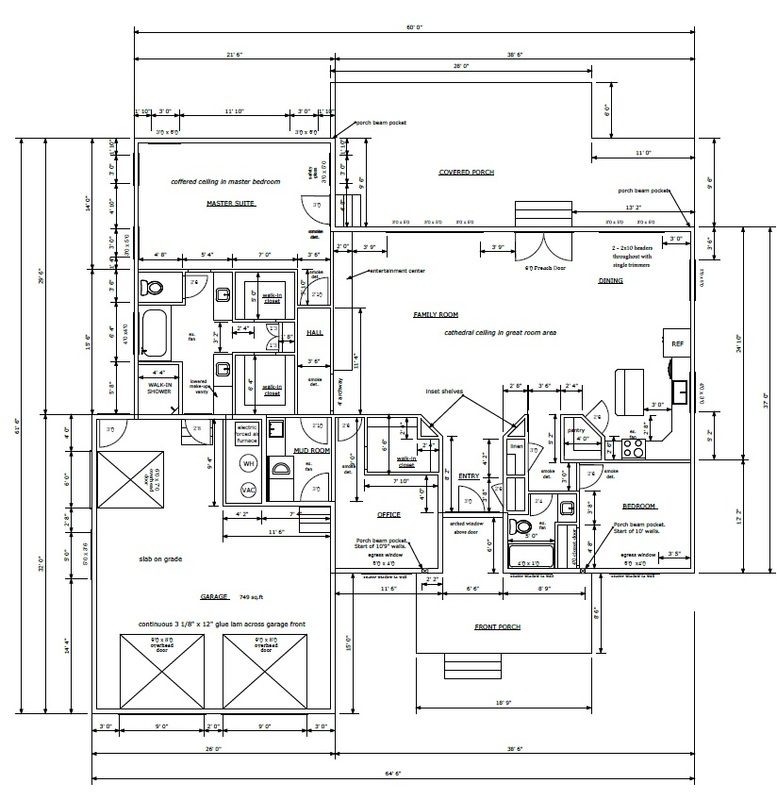 Scan any sketches you have made and create jpegs files or pdfs or if you have done your prelim plans in a home planning software produce a jpeg of your rendition and send that by email and I will use them as the starting point for your permit set. If you can’t produce sketches or preliminary plans of any type that is fine too. Just call or email and we can get a dialogue going either through a survey of questions I can email you or just through a casual interview process over the phone or at my office. Call me first to talk about your project and set up a meeting or just email me. I will give you an estimate and we can get going. Per our telephone conversation of last week, I am sending you a couple of attachments for your review in preparation for house plans I am hoping you will be able to work with us on. The scanned copies are of sketches my wife and I came up with that I hope you can excuse the crudeness of. 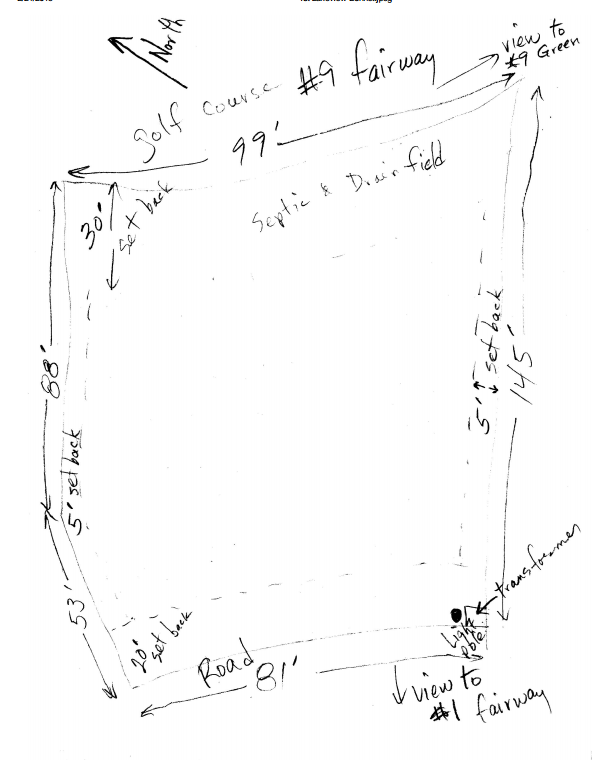 One of the sketches will give you an idea of the lot layout we have while the other includes some of the ideas and basics of the home we would like to have built for us. We will need the plans drawn as discussed so we will be able to get the proper permits and the builder will be able to build. You can call me most anytime on my cell phone with any questions or clarifications. Please let me know how much money you need and when for this project and I will get you either a check or credit card (whichever you prefer). Details on the house – We are looking for a single story plan with no basement. 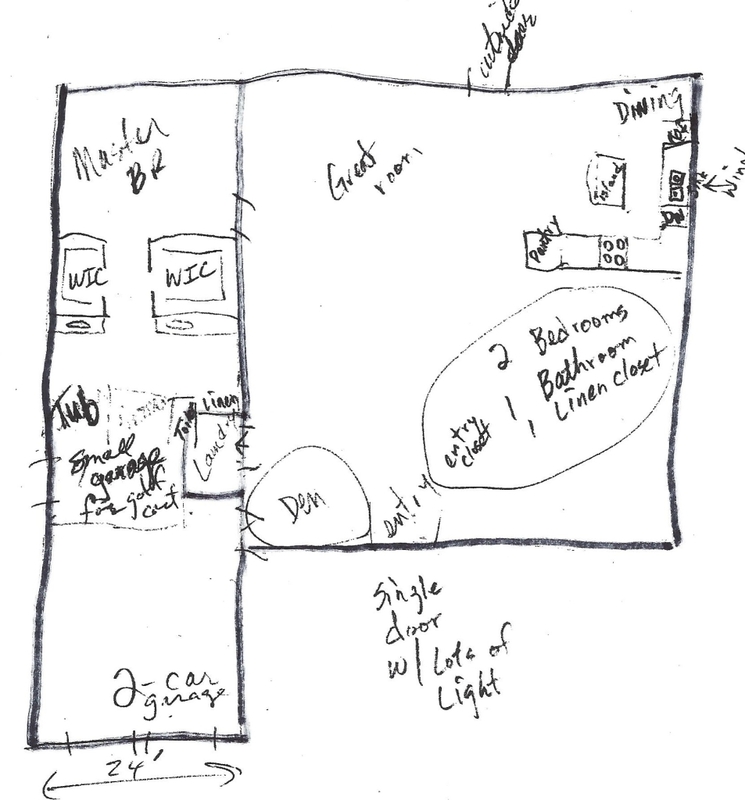 I think a crawl space makes the most sense but I am not a contractor or designer so any particular recommendations will be greatly appreciated. I would like to keep the square footage in the 2000 square foot range but I my wife seems to keep adding ‘required’ features that may push it into the 2300+ range. Again – any and all suggestions will be appreciated! I have tried to sketch some basic ideas we have and will try to explain them further. We want to have plenty of light coming in so windows in the front and rear should be generous. My wife would like a tall entry (with a couple of pillars) in the center of the house open to the back of the house. We would like the master bedroom and other bedrooms on opposite ends of the house. 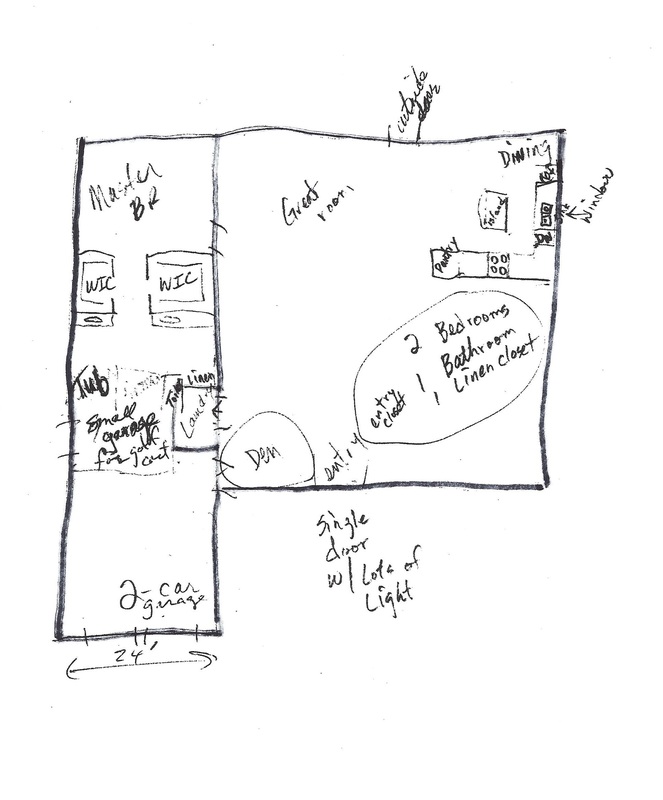 The sketch is in no way to scale but we would like the kitchen on the east end of the house with the dining area in the rear and the sinks on the outside wall under a window. The kitchen is to be in the shape of an ‘L’ with an island big enough to seat a couple of stools at. We would like the master bedroom to include dual walk in closets with separate sinks. I tried to draw the 2 closets as being different sizes as well as the sinks being behind each closet. The bigger of the closets would have a larger counter area next to the sink with a sitting area for the wife to put on her makeup in the mornings (She seems to think this is important!). We would like a separate garden tub and large tiled shower. The toilet should be in an enclosed room. We would like a 2-car garage with dual doors off the front with an extra smaller garage area accessible off the side for golf cart storage and the lawn mower. I was thinking if we made the garage a little wider than normal, we would have some room for storage on at least one of the sides. We would like the laundry room big enough to hold the washer, dryer and a sink. A small den to the left of the entry would be nice. An entry closet near the front door, 2 other bedrooms, a full bath and a linen closet is what we are hoping to incorporate into the right front section of the house. For the outside, we would like a covered patio on the rear of the house and some sort of a porch on the front. We might need to have a discussion together with my wife to better explain what she is looking for. I would like to see as much maintenance free materials used as possible but I am not sure what that might be. There are varying types of siding and roofing in the area so nothing will look out of place. His email and sketches were more than enough to get me creating a 3D model. I have the Pro version of Sketchup which allows me to take the 3D model into another program called Layout where I put the model into 2D and make the necessary annotations and add the dimensions. And then 5 or 6 months later, what was once a rough drawn sketch and a list of wants and needs becomes a home two people will enjoy for years to come. For another example click here.